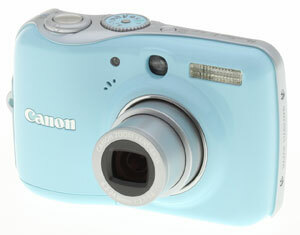 With a playful array of body colors and a compact size, the Canon PowerShot E1 practically shouts "Summer!" Available in a feminine color selection of white, pink, and aqua (shown), the PowerShot E1 boasts a 10-megapixel CCD and 4x optical zoom lens, equivalent to a 35-140mm lens on a 35mm camera -- all packaged in a hip, retro-chic body. And because the PowerShot E1 is all about having fun while snapping pictures, Canon included a true optical image stabilizer to help reduce blurry shots when shooting on the go. Pointedly geared toward younger consumers, the PowerShot E1 is a solid point-and-shoot model with a lot of easy-to-use automatic features. The camera's intelligent DIGIC III Image Processor features Canon's effective Face Detection technology, which works in conjunction with the autofocus, exposure, and white balance systems to optimize all three for the best possible portrait shots. And because the Canon E1 will be popular with younger users, it features an Easy mode for straight automatic shooting and a greatly-simplified user interface. That said, the PowerShot E1 also features a healthy selection of manual controls, such as white balance, exposure compensation, ISO, etc. The Canon E1 also offers an extensive array of preset Scene modes, with no less than 13 presets for common-yet-tricky conditions like indoor no-flash shooting, beach shots and night scenes. The Canon E1 features a bright, 2.5-inch color LCD monitor in addition to a tiny real-image optical viewfinder. Though accuracy isn't as good with the optical viewfinder, it does greatly reduce the drain on battery power when the LCD monitor is switched off, and gives an alternative framing option when shooting in very bright sunlight. Though the LCD monitor is pretty bright, the highly-reflective screen does hinder its luminance under harsh sunlight. Continuing with its easy theme, the Canon E1 has just a handful of external controls and a couple of quick-access buttons for things like Face Selection and direct printing. Light, compact, and pocket-friendly to match its fun color scheme and design, the Canon PowerShot E1 weighs in at just 5.6 ounces (160g) and measures just 4.0 x 2.5 x 1.2 inches (101 x 64 x 31mm). The Canon PowerShot E1 is available at a suggested retail price of US$200. Fun and vivacious (if you can call a camera vivacious) with its retro color scheme, the Canon PowerShot E1 continues a long line of quality, inexpensive, mid-size point-and-shoot digital cameras that use AA batteries. Canon's point-and-shoot models are consistently good performers across the board, with a strong emphasis on ease-of-use and user-friendly design. Look and feel. Though it falls into our mid-size digital camera category, the Canon PowerShot E1 is still quite compact and pocket-friendly, important factors to match its fun body design. Light weight and easy to handle at just 7.3 ounces (207g) with batteries and card, the Canon E1 won't be a burden out in the field. The grip offers a reasonable bulge, but the included wrist strap is still a must to prevent you from dropping it and scratching that shiny finish. The Canon E1 comes in white, pink, and aqua, and features a retro-inspired modern design with its flower-shaped speaker cover and muted silver accents. Even the matching packaging is ultra-clean and minimal. The smooth, plastic body feels good in the hand, and one-handed shooting is definitely possible with the camera's limited controls. I found the Canon E1 fit quite comfortably in my medium-sized hand, and I could easily twirl the Mode dial with my right thumb, as well as control the zoom and access the menu. All in all, the Canon E1 is a comfortable design that's easy to negotiate. Controls. A small, silver button on the top deck powers on the Canon E1, just next to the Mode dial. The Mode dial is well-placed, and easy to activate with your thumb. The detents are firm, making it difficult to turn by accident, which is nice. 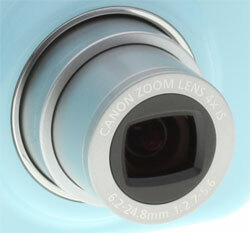 The Canon E1's Zoom ring surrounds the shutter button, making for quick and easy framing with your right index finger. Your thumb rests over the speaker on the back, but can easily slip over to the Playback button. However, the Playback button does require a fairly firm press to actuate, so accidental activation should be a rare occurrence. A small but usable optical viewfinder allows you to frame images without using the Canon E1's LCD monitor, though its view is quite limited, only showing 81 to 77 percent accuracy from wide to telephoto, respectively. The Canon E1's LCD gives you a much better sample of what you'll get when you press the shutter, though, at 100 percent. On the rear panel, a useful Face Selector button lets you highlight a face in the composition for the Canon E1 to track as it moves; another excellent feature for tracking busy children. The Print/Share button on the rear panel lets you quickly print images directly from the camera, once it's plugged into a compatible printer, such as the SELPHY and PIXMA series printers, or any PictBridge-compatible printer. It can also enable instant downloading to a computer. Lens. Ranging from 35 to 140mm equivalent, the Canon E1's 4x zoom is of good quality, with low distortion at wide-angle and only moderate blurring and chromatic aberration in the corners. Thus, the PowerShot E1 may be performing at least some processing of images to improve overall sharpness, distortion, and chromatic aberration. The Canon E1's lens features Canon's optical Image Stabilization, which works to counteract any slight blurring caused by camera movement. 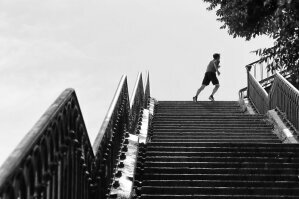 You can control how often the system kicks in, whether it's continuous or shot-to-shot, as well as put it in Panning mode to track a moving subject. Very handy when shooting kids. Modes. The large mode dial on the top deck is missing the Playback mode setting, which is activated by a button in the top right of the PowerShot E1's rear panel. (We prefer this layout, as a press of the shutter release quickly returns the camera to Record mode.) A handful of the more commonly-used preset Scene modes have positions on the Mode dial, while the remaining, more obscure modes are accessed through the Scene position. Also on the Mode dial are the standard Program AE and Auto modes, with an Easy mode indicated by the heart-embellished icon. The Canon PowerShot E1's Easy shooting mode goes beyond the standard Auto mode, which simply takes complete control of the exposure, and employs more intelligent decision-making from the camera. From employing Face Detection, to automatically enhancing exposures for portraits, to keeping image quality as high as possible under a variety of conditions, Easy mode is perfect for novices or users who really don't care about what the camera is doing and just want the best pictures they can get. Menu. 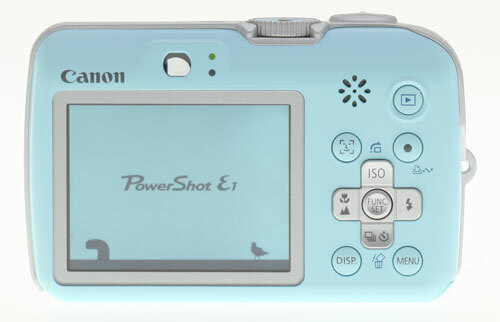 The Canon E1's menu is straightforward and similar to other PowerShot models. You can customize its color, and font size is large enough to be readable by a range of users. Pressing the Menu button on the rear panel activates the main shooting menu, with top-tab access to the camera's main setup menu as well. Like many Canon digital cameras, the PowerShot E1 has a standard shooting menu, as well as a separate Function menu accessed by the center button of the rear panel multi-controller. Options on the Function menu remain predominately the same through the various shooting modes, featuring exposure compensation, white balance, My Colors, metering, resolution, and quality. In Scene mode, a top option becomes available to allow you to select one of the specific presets. Storage and battery. The Canon PowerShot E1 stores images on SD/SDHC memory cards, for a current maximum capacity of 32GB per card. That'll be sufficient for most needs with this camera, and indeed a 4 to 8GB card should be sufficient unless you plan to shoot a lot of video with the Canon PowerShot E1. The Canon PowerShot E1's battery compartment houses two AA-type batteries, and is covered by a hinged, locking door at the bottom of the handgrip. A standard set of AA alkaline batteries is good for about 220 shots with the LCD on, or about 650 shots with it off. With a set of NiMH rechargeable cells, those numbers increase to 450 shots with the LCD on and 1,000 with it off. Not too shabby, but still worth picking up a spare set of batteries and a good quality charger. Shooting. A consistent quality among Canon digital cameras is their ease of use, whether shooting with a higher-end SLR or a more basic point-and-shoot variety. The Canon E1 falls into line here, as operation is a breeze. The majority of automatically controlled functions means that you can focus entirely on composition and framing, while the camera handles everything else. Well-marked and laid-out controls make the camera easy to navigate, and even diving into the menu system is a snap. The Canon PowerShot E1's zoom is fairly smooth, though a little sluggish and not as responsive as some when you let off the control. Still, performance is good. Overall, shooting with the Canon E1 is fun, just like it was designed to be. The camera's small size, capable automatic performance, simple-yet-savvy interface, and overall light-hearted appeal make it an easy camera to learn and a good one to shoot with. Sharpness: The wide-angle end of the Canon E1's zoom shows only moderate blurring in the corners, with the strongest instance in the lower right. At telephoto, blurring is really only minimal. Geometric Distortion: The Canon PowerShot E1's lens produced fairly low barrel distortion at wide-angle (0.7%), and only one pixel of barrel distortion at telephoto, which is virtually invisible. Though distortion is visible at wide-angle, it's really very mild in comparison with other digital cameras. Chromatic Aberration: Chromatic aberration at wide-angle is minimal in terms of pixel count, though a few bright cyan and magenta pixels are visible. Telephoto, however, exhibits slightly higher pixel count, with about the same level of brightness. Though it's important to note here that some blurring is increasing the effect at telephoto. Macro: The Canon PowerShot E1's Macro mode captures a sharp image at the center, with softness radiating out from the center. Minimum coverage area is 1.39 x 1.04 inches (35 x 27 mm). The camera focuses so closely that the flash is partially blocked by the lens in the lower portion of the frame, with strong overexposure at the top. Thus, external lighting will be your best bet this close. Color: The Canon PowerShot E1 produced good overall color, with the only strong oversaturation occurring in bright red tones. Blues are just slightly pushed, but yellows and greens are just about right. 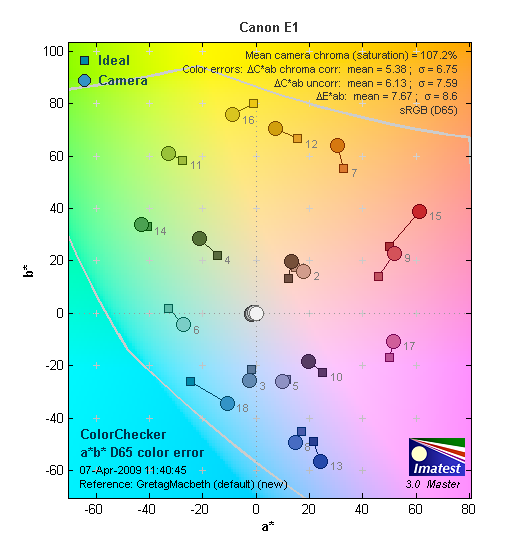 In terms of hue accuracy, the PowerShot E1 shows only a few small color shifts. Cyan is pushed toward blue, for bluer skies, and oranges toward yellow. Lighter skin tones are just a hair toward pink, while darker skin tones are pushed toward orange/yellow for warmth. ISO: Noise and Detail: Detail is good at ISO 80 and 100, with some softening beginning at ISO 200. 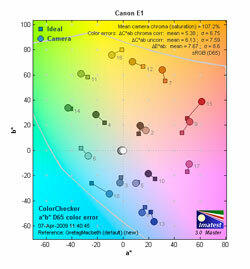 Chroma (color) noise is fairly well controlled at the lower ISOs, but becomes visible at ISO 200. Luminance noise is the main problem, starting around ISO 200. By ISO 800 and up, detail is just about gone. Still, this isn't bad for such a small, inexpensive digital camera. See Printed results below for more on how this affects prints. Flash: Canon PowerShot E1 performs about as Canon says it will, though it had to boost the ISO to produce the desired results. It increased ISO to 250 at wide-angle, and to 320 at telephoto. Still, performance is good with even coverage, so the PowerShot E1's flash will yield good results in most normal situations. Incandescent: The Canon PowerShot E1's Manual and Auto white balance settings handled our tungsten lighting test well, while Incandescent mode resulted in a very reddish image. Printed: ISO 80 Printed results look good at 13x19 with good color and detail, except for slight color noise in the shadows. This becomes less pronounced at 11x14 inches. ISO 200 and 400 also look good at 11x14, which is just about right for a 10-megapixel digital camera. ISO 800 shots are usable at 8x10, and better at 5x7. ISO 1,600 shots are still surprisingly usable at 5x7. Overall, a good performance for an inexpensive digital camera, better than most at this price. Shutter lag: Full autofocus shutter lag is good, at 0.54 second at wide angle and 0.61 second at full telephoto. Prefocus shutter lag is 0.076, slower than average but still quite fast. Cycle time: Cycle time is also fair, capturing a frame every 1.96 seconds in single-shot mode, and every 0.76 second for a burst rate of 1.32 frames per second. Flash Recycle: The Canon PowerShot E1's flash recycles in a slow 10.8 seconds after a full-power discharge. As is typically the case with Canon's PowerShot line, the E1 performs quite well, with good color and exposure across a broad range of exposure conditions. Color is just about spot-on accurate, with only minor deviations in saturation and hue accuracy. Luminance noise is a little high at the middle ISOs and up, though detail remains quite strong at the lower ISO settings. The Canon E1 is fairly quick, with good shutter lag, though shot-to-shot cycle times are about average. The Canon E1's 4x optical zoom lens produced good quality images as well, with low distortion and only minimal blurring in the corners. Styling is more for the younger shooter, resembling a Hello Kitty product, but there's no denying that the Canon E1 captures very good images, so it's a clear Dave's Pick.